Red Pocket Mobile is running a 99¢ SIM card promotion. 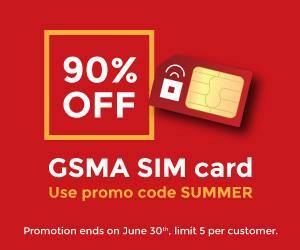 Now through June 30, RedPocket GSMA SIMs are 99¢ when you use the promo code summer. Regular (aka mini), micro and nano SIMs are all available at the 99¢ price. These SIMS are for Red Pocket's AT&T based "GSMA" phone service and will work in any AT&T phone, locked or unlocked, as well as unlocked GSM phones. SIMs for the Red Pocket's T-Mobile based mobile broadband service are not included in this deal. Red Pocket's GSMA service uses AT&T's 4G HSPA+ but not LTE. Plan prices start at $5/month for pay as you go with unlimited monthly plans from $29.99 for unlimited talk and messaging, 100 MB of data, 40 outgoing international texts and a $1 international call credit. Pay As You Go and $39.99 RedPocket GSMA plans include unlimited no extra cost calls to landlines and mobiles in Canada, China and India and to landlines only in the UK and the cities of Mexico City, Guadalajara and Monterrey Mexico. See Prepaid Operator Profile: Red Pocket Mobile for more about Red Pocket including details of all plans. What's the difference between these SIM cards from Red Pocket for $0.99 vs from Amazon for $0.01? (Serious question.) Are the cards direct from Red Pocket superior in some way? A SIM is a SIM, there shouldn't be any difference. 99¢ is still pretty cheap but some folks are Ebay adverse. Lots of penny SIMs available on Amazon (not eBay, just like I wrote in my original comment). If you need a nano SIM and do not have a SIM cutter, buy it from Red Pocket. Amazon does not sell them for 1c or 50c. Good to stock up for future service deals. Math failure in this article. Red Pocket charges $1 for a SIM with the promo, not 99c. 90% of $9.99 is a $8.99 discount. Red Pocket has useless customer service. They could not activate my phone and after hours with support trying to get the phone to work they would just leave me on hold and never come back I would have to call them back over and over again and when I asked for a refund they refused. I gave up and switched to another service and the same phone activated in minutes with no problem but I never got my money back from Red Pocket I payed for a service they didn't provide and they didn't seem to surprised that the service wasn't working. Red Pocket just took my money and never tried to make it right. This company is a rip off.